Turkey is a modern country with a sophisticated highway system. The bridges on the Trans-European Motorway are designed to the latest AASHTO specifications and they performed well during the 1999 Kocaeli Earthquake. 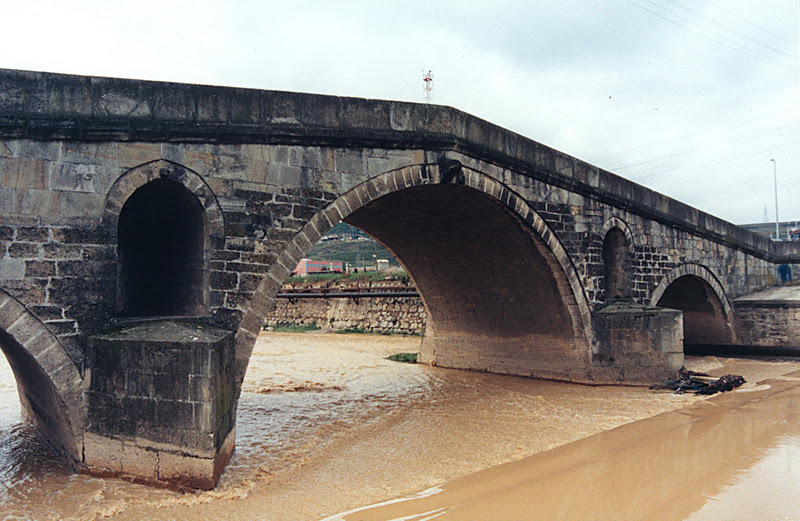 Still, Turkey is a country with a long past and occasionally you come upon a bridge from another era. Körfez is a little town on the eastern shore of the Sea of Marmara near Istanbul. It was here that I saw a closed spandrel, stone masonry arch with cutwaters and openings at the piers. The deck rises to a peak above the large, central arch. It looks like the bridge was built just downstream of a weir. The river is contained within stone walls of the same vintage as the bridge. Its still in use as a pedestrian crossing over the river. I wonder how long ago this bridge was built? Arch Bridges: Körfez Bridge by Mark Yashinsky is licensed under a Creative Commons Attribution 3.0 United States License.